At first, they just signaled the times of church services and gatherings, or the arrivals of dignitaries, disasters, and enemies. Before long, a kind of language developed, and after a while, in some cultures, a certain strike on a bell even confirmed the sale of a cow. But mainly they were used by churches to count the hours of sacred time, and to inform the community of what was happening at its spiritual heart: "Come, let us worship..." "I believe..." "Send down your Holy Spirit upon us, and upon these gifts here offered ..."
And when the service ended, they sang forth the mighty works of God. In the Russian tradition, the zvon, or peal, depends, of course, on the occasion. For funerals, weddings, feasts, or processions there is a theology in sound, not unlike the theology in color of the corresponding holy icon, though more improvisational, and more public. The ringer, ordained to interpret the true Christian understanding of sorrow, tolls for the dead and makes present the bright sadness of Holy Week; called to proclaim the Resurrection, announces the good news of Pascha; sent to rally the community, captures and expresses the tempo and movement of a festal procession. Thus are sacred history extended, and the saints celebrated. We eschew machined bells and loudspeakers because, like church singing, bell-ringing is a human art (though some say angelic), not an appliance. Thus, like persons, every Orthodox bell is unique, singing not with a clapper and a manufactured note, but with a tongue and a voice. The voice must be clear, rhythmic, melodious, sonorous and resonant, but its beauty resides in the shading of its unique tones and overtones, like a human voice, while its all-surrounding power and penetration convey something of God's Own. If it can't do that, it's cast again into the founder's fire. Famously, one such miscreant survived such a fate, but to this day is called "The Goat". The zvon of the bell manifests the faith of the Church that cast it - of humans familiar with fire and molten metal, with earth and sky, with form and sound just as an icon also reveals the Church's soul. It makes spiritual space palpable. Russian philosopher Ivan Ilyin paraphrases: "The vibrations set off by the peal create, in a world of dense matter, an image of sunlight piercing the atmosphere, of the gleam of candles in a dark church, of the fragrance of myrrh, streaming from the bones of a saint." 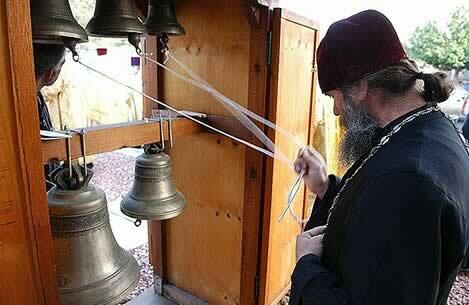 If a single bell is a resounding icon of God's voice, then the zvon of all the bells together is an icon of the liturgy, of its atmosphere. Born in the depths of the Church's spiritual relation to matter, it interprets our understanding of God and creation. Great bell-ringers contemplate the vessels of their tradition, and find in them a point of contact, synergy, and co-creation with their ancestors. Actually, anyone can hear this vivid perception of God and spirit which resounds through the centuries. What did our church sound like, 400 years ago? Is sounded like this. And 400 years hence? It will sound like this. Yet on this day, this ringer combines the sounds our ancestors handed down to us in solid bronze- in an astonishing new masterpiece, conveying in rhythm and sound the theological dynamism of what is happening, by God's grace, in our midst right now. 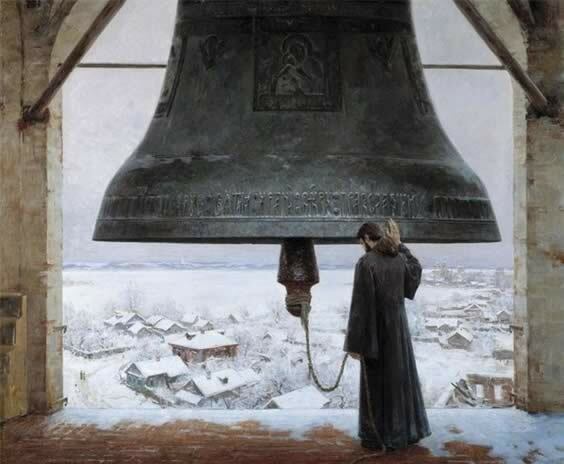 A monk, one of Russia's most talented bell-ringers, put it like this: "When the ringer approaches the bells prayerfully, his sould rings as well", and with an exultant peal he paints the church's vision in sound and space. Taking inspiration from the service, from prayer and from communion with God, the bell-ringer expands the Church's experience of peace and faith out into society, sharing and embracing all of creation in the One sacrament of communion. "The sound of the bell evokes a profound response in the spirit and soul... an unusually powerful response, made less perhaps by beauty, than by awe at such beauty." Suspended between heaven and earth, the bell lives in two worlds and, by its sound, joins them. Russians say, "The great bells are thunder in the sky; the medium ones are wind in the forest, the smallest are the birds.... the elements are singing!" The ringer finds him or herself in a realm of wind, sun, sky and birds, outside time. "I always look up, over the earth and into the sky" one bell-ringer said. And a Muscovite wrote down, "The zvon comes from on high. You can't see where it comes from... it floats above the city like a cloud—pure, weightless, and free. It's in the heights, and from the heights; it's unreachable as a cloud, as the azure sky itself—above and beyond humanity, like the sun or moon, high and free and beautiful. From the bells: sound, made spirit. - With gratitude to Hierodeacon Roman, bell-ringer at St. Daniel Monastery, Moscow for the inspiration, and to John Burnett, formerly of BlagovestBells.com, for writing it down.